From an early age girls are taught they they are worthy of a prince charming and they wait for the day that he comes on his white horse to take her off into the sunset; however, love isn’t like that. Love is confusing, surprising, painful, and enchanting. Love is Serendipity. This book takes you into the world of one girl searching for her prince in a small rural town during her High School years. Each and every poem takes you through an emotional rollercoaster of flirtations and infatuations in the span of four years as she finds that it takes a lot of frogs before you can meet Prince Charming. 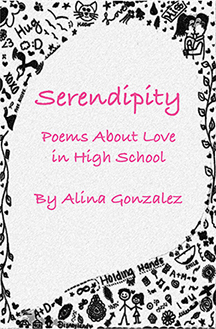 Based on actual events, Serendipity will remind you of your first love who promised it would last forever. “Partner, soul mate, parent, God…. What is love and where is love? Alina searches and writes and draws the reader in. Serious stuff.” Rita Steele, retired teacher.